So the funniest part of the story is that we discovered an unsuspected truth about jigsaw puzzle production, which is that the same rectangular puzzle may be cut upside down, and we happen to have now, one of each of the ways it can be cut. The solution is either to buy yet another puzzle, or perhaps patch together the top of one and the bottom of another to have mirror-images, but that would require that I have a complete top of one and a complete bottom of the other. It will be that much more challenging because each cupcake will have a twin with pieces that only fit in one of the twins. The girls think that's a great idea but I'm not so sure. 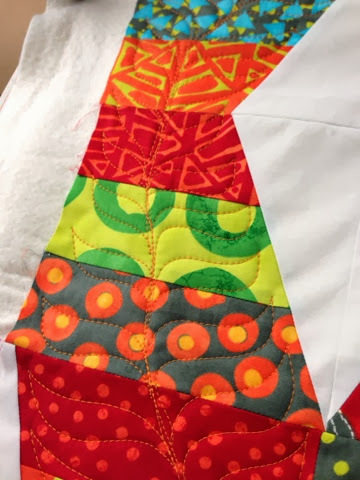 I can't remember the name of the pattern for the above quilt, but will add it when I get to my notes on the third floor. It wasn't without many careless mistakes, but this top is now pieced. I really liked this fabric line the first time I saw it, and impulse-bought a fat quarter bundle along with some extra bits. 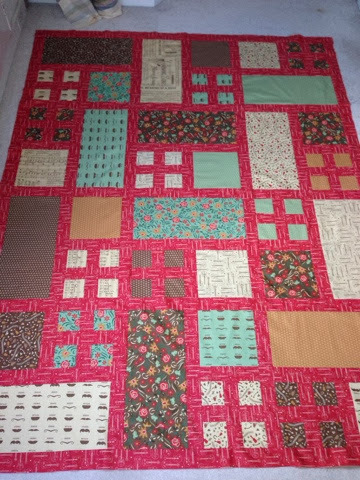 It did not please me as much after arriving, but was certainly worthy of being put together into a quick quilt. Still, my love for the fabrics waxes and wanes. It's a western theme, but the colors aren't my usual cool blues or brights. I had imagined a cowboy theme, which of course, given my obsession with cowboy boots, appealed. Instead, it evokes more of a wild west, villains and train robbery feel to it, and I'm having a hard time relating. I'm going to quilt it onto a warm batting and offer it to the church in Concord where the homeless come to sleep when it is bitter cold outside. I suspect it will look better and better when washed and dried many times. 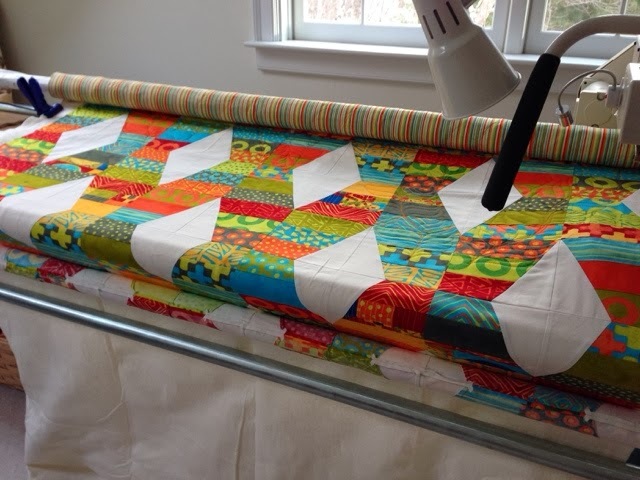 I've been trying to work on the quilting backlog which only grows bigger in that big basket under my long-arm machine. Taking advantage of the forward momentum of my Hugs and Kisses Quilt, I've made a very good run at this. I'm no pro, but the leaves and vines are coming out as good as I'd have asked if I'd sent it out. So in the spirit of a past president, who declared it well before the end was in sight, "Mission Accomplished." I'm going to try to do the white diamonds in a similar, swirly, leafy quilt stitch. Low expectations. Seriously. As for stash, I've bought some dotted basics from Hancock's and some more dog fabric to make more, (!!!) dog beds because Beaulieu and Birdie are much bigger than I'd predicted, especially sprawled out and sleeping. Also, to be honest, some of that dog fabric made me so happy that I ordered extra just for the joy in it. I'll probably try to make a quilt out of some of it because it's really just so warm and great.